The first one is the Catrice Lipstick in "Alluring Pink" which is a gorgeous dark pink color and always reminds me of a bubble gum. And let it me first just put out there: The packaging is ROSE GOLD! I mean how pretty is that?? It's the cheapest one in my collection but I love it. With it's smooth texture the lipstick is easily applied and stays on for a really long time. The color is intensive too. It gives you a girly but still serious look and it seriously goes with everything. Second is the MAC Lipstick in "See sheer" which is a brownish red color. It's perfect for autumn time and the color always makes me think of fallen leaves. 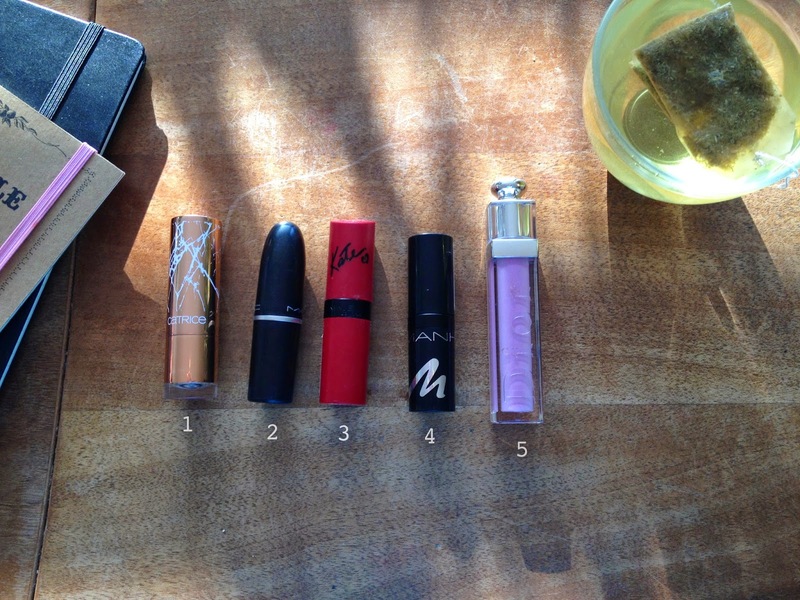 As known for Mac lipsticks, it is really pigmented and creamy. The color is natural on your lips even though it doesn't look like it when your see the color. So this lipstick is easily wearable for your everyday make up. The middle one is the Rimmel Lipstick in 170 from the Kate Moss collection. And oh my god I love it so much!! I have never purchased such a creamy and light lipstick before! It's super easy to apply, doesn't dry out your lips at all and is just gorgeously pigmented. It leaves you with a super soft feeling. It's a really bright red color and just gives your face a special touch with every look your going for. And to add, this lipstick is wearable all days long without this nerve-racking dehydration. I can only recommend this! 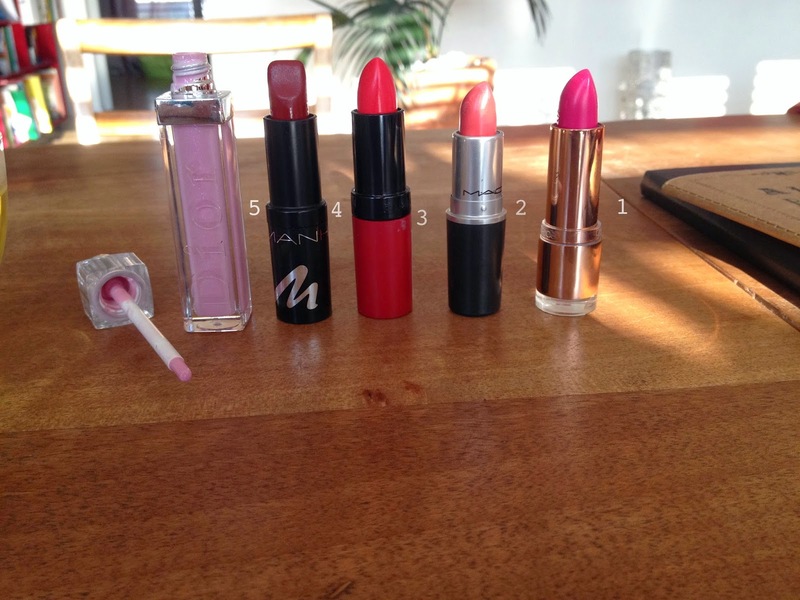 Next one is the Manhattan lipstick in the number 54v which is a deep reddish-plumy color. I'm obsessed with this one during winter and autumn and it always gets me into a festive mood. I basically love to go dark on the lips but often I'm not brave enough. This color is super pigmented and oh my god it last on your lips for ever! Sometimes I wonder if they put in some superglue haha but it's true! Sometimes even after cleaning my face you can tell that I wore a red lipstick! The only thing that I don't quite like is, that after a while the lipstick can get a little dry and also it's consistency is not the creamiest. But I still LOVE it and I would totally recommend it! So go for it, wear dark! I hope you liked my top five lipsticks and always remember after such a shopping spree your purse may will be crying but your lips will be laughing.